Peter Didn’t Walk on the Water | Relijournal. A familiar story with a little different look at it, this isn’t what the title suggests. This past weekend Billie and I were on PA to attend a family reunion of her dad’s side of the family. Last year we weren’t able to make it to the annual event so we had a lot of catching up to do. What a wonderful time we had getting to see friends and family that we hadn’t seen, or even spoken with in some cases, in nearly two years. The smiles, hugs and handshakes began as soon as eyes met. Even though it had been such a long time since we’d been able to visit with these folks, it felt like it had been merely weeks or a few months, not two long years. If these types of meetings here on earth are so endearing, can you even begin to imagine what the reunions with loved ones who have gone on will be like someday in Heaven? And so much more, what it will be like to someday finally see and be able to worship Jesus right at His feet? Indeed, what a day that will be, as the old song says, when my Jesus I shall see! 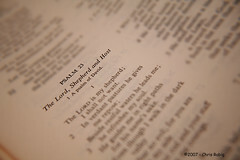 (1) <A Psalm of David.> The LORD is my shepherd; I shall not want. I thank You for the knowledge that when the race here on earth is run I have something far, far better to look forward to, and not of anything I have or ever will do but by Your grace alone. If life happens to deliver a situation to you that you cannot handle, do Not attempt to resolve it yourself! Kindly put it in the SFGTD (something for God to do) box. I will get to it in MY TIME All situations will be resolved, but in My time, not yours. Should you grieve the passing of another weekend; think of the woman in dire straits, working twelve hours a day, seven days a week to feed her children..